Then we could pick it up and spin it again. This is just what people do, isn’t it? Keep it spinning. From the one that got away, Alice Walsh’s original submission to THE SOUTH CIRCULAR last summer, we take our lead for this issue. * Keeping it spinning, thinking about throwing the first punch, rubbing the wrong way and residing in drawn-out goodbyes are these stories’ routes out of conflict, out of love, out of grief. I’m calling this the fightin’ and ridin’ issue. Certainly the most perpetual acts in life provoke fabulous and familiar renderings in literature. Often daily life is only the movement in and out of orbits of old and new acquaintances, each encounter more or less interesting, more or less useful, more or less healthful than the last. 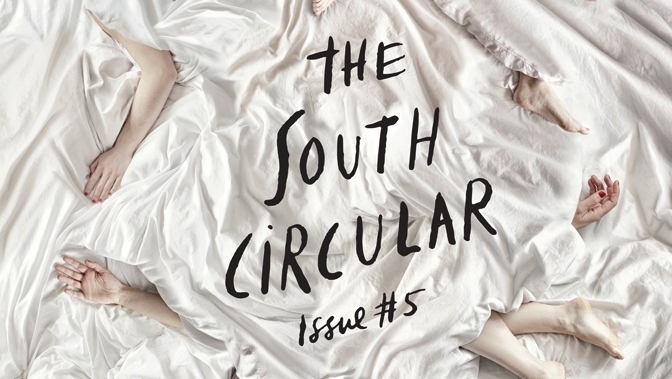 And with each penetration of another’s (un)safely guarded orbit, the stories here by Patrick Gleeson, Barry McKinley, EM Reapy and Alice Walsh show us a little more about our own limits and our own tastes. I used to think it impolite to lose the flavour of another’s environment after I’d moved away out of it. I’d honour that person by remembering their many properties; I’d swear to never think less of them for as long as I should breathe; and I’d relive our moments over and over again. But now I know that this exhausting baggage of liaisons come and gone was only really possible when their number was few. And with emigration’s paws reaching out for my nearest and dearest, with circumstances and needs growing inwards, finding a new way to honour that past is itself a lesson in the limits of the shades of friendship and love. Our cover stars M&E have created a sublime work which captures the exquisite complexity of life’s necessary liaisons. And like all good visual responses it will exist and triumph apart from the stories in issue 5. Finally, I must admit to a certain pride in reaching a fifth issue of THE SOUTH CIRCULAR. We are one year old, we have learned much, we are still young and we still care to bring you the work of new writers four times a year. I’m proud of throwing a punch at the digital publishing revolution and I’m glad to still be in the ring. And I’m especially proud of the small but growing orbit of writers, artists, editors and readers who have gathered round this spinning top. * Alice’s story, ‘It’s Crazy What You Could’ve Had’ went on to be published in issue 13 of wordlegs.